The true king of rolling floor jacks, the Ranger RBJ-30TL rules the garage floor with its mighty 27,216-kg. lifting capacity. The RBJ-30TL takes Ranger's air-hydraulic technology to the extreme. This is our most powerful garage floor jack, easily managing a hefty 27,216-kg. in the first phase position and 13,608 kg. at the ​305 mm max lifting height. 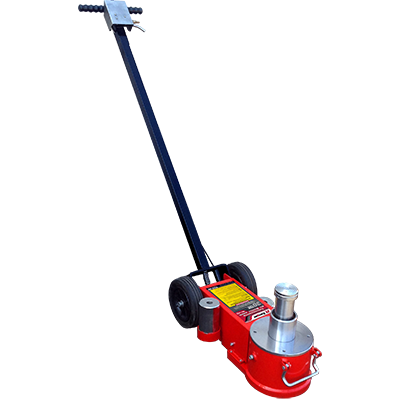 The RBJ-30TL garage floor jack was designed for heavy commercial use and features a long “T" handle for easy positioning, as well as large rubber wheels for smooth manoeuvring around the garage. Floor jacks as powerful as these essentially offer you the lifting power of a car lift without burdening your garage space. Two jacks working together can simultaneously lift a ​54,431-kg. vehicle into the first position and a ​27,216-kg. vehicle in the second position. For a compact hydraulic floor jack, we’d say that’s pretty impressive. Since it accommodates other vehicle types too, you’re completely safe and covered with this jack. As always with Ranger, safety is just as important as an excellent product, so the RBJ-30TL has a built-in safety valve to prevent overloading. With a low profile ideal for low ground-clearance vehicles and the included additional lifting saddles, the RBJ-30TL is the versatile heavy-lifter you've been looking for. In fact, its ​165 mm collapsed profile is excellent for virtually all light-duty trucks and SUVs, making it the best floor jack for heavier classes of vehicles. While it’s designed for heavy-duty commercial applications, this jack can be used to lift smaller vehicles with ease. This product offers infinite versatility up to the rated lift capacity, so it may be one of the last floor jacks you ever need!